There is currently just the 1 ferry route running between Shetland Islands and Orkney Islands operated by 1 ferry company – Northlink Ferries. The Lerwick to Kirkwall ferry crossing operates weekly with a scheduled sailing duration from about 5 hours 30 minutes. Whilst we’ve taken great care to ensure the information on this page is correct, as the frequency and duration of crossings on all routes can vary from time to time we’d advise that you get a live quote for current availability on this Shetland Islands Orkney Islands crossing between Lerwick and Kirkwall. 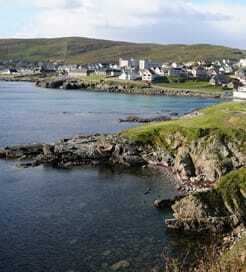 The Shetland Islands are a Scottish archipelago situated to the northeast of the British mainland, close to Norway. Comprising over 100 islands, of which 15 are inhabited, Shetland boasts a rugged and unique landscape of immaculate beaches, clear blue seas and dramatic clifftops. Also, given their proximity to the Norwegian coast, there are Scandinavian influences to be found everywhere from place names to the local dialect. 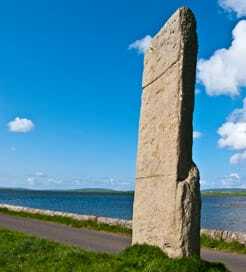 Like most Scottish islands, the Shetlands are home to a great number of historical sites including picturesque castles, fascinating Pictish wheelhouses and mysterious standing stones. They are also a top destination for birdwatchers, as they’re populated by a wide range of seabird colonies. Travelling by ferry is a popular way to explore Scotland’s beautiful archipelagos and, from the Lerwick ferry terminal in the southeast of Shetland’s main island, there is a choice of sailings to the Orkney Islands and the Scottish mainland. The Orkney archipelago encompasses seventy islands within the Northern Isles of Scotland, roughly sixteen kilometres north of the mainland. Unique as they are picturesque, the Orkney Islands are one of Scotland’s greatest feats. Mostly flat in appearance, they’re steeped in millennia-old history, with the island of Rousay nicknamed ‘the Egypt of the north’, owing to the sheer number - over a hundred a fifty - of archaeological sites, including a five thousand year old chambered tomb. A heavy Viking influence is another hallmark of Orkney’s identity, apparent in the architecture of the Kirkwall Cathedral and almost every place name Norse in origin. Orkney is also one of the best places in Britain to watch the marvellous Northern Lights, and to spot tens of thousands of migratory bird species, dolphins, whales, and seals basking on white-sandy beaches. Sandwiched between northern Scotland and the Shetland Islands, it’s easy to sail to Orkney from both locations. From a few ports on the mainland’s north coast, there are fast and regular crossings to a couple of towns in Orkney, while the routes from Aberdeen and Shetland run three times a week.